Miller's had his birthday party yesterday. Let me tell you a little bit about Miller. He is a lot like his Mama, he does not do well with change. for the next year the day after his birthday party. 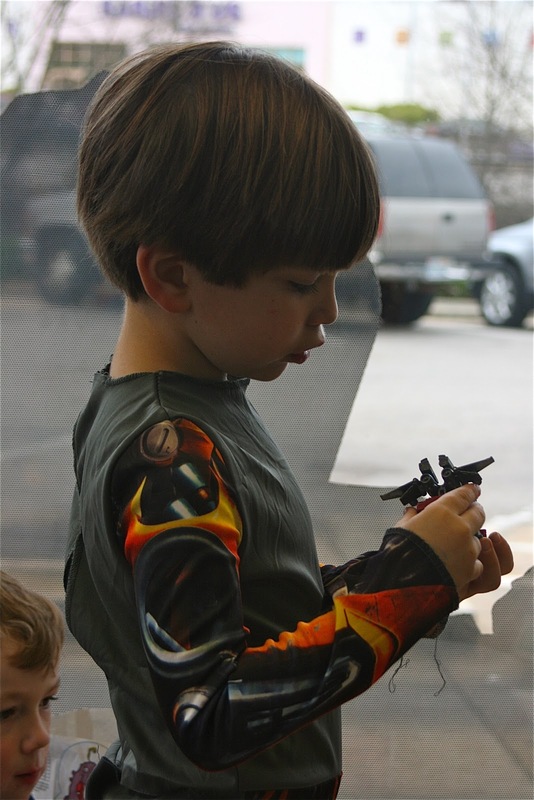 Last year, Miller had a transformer climbing birthday party at Moss Rock Preserve. It was awesome! So much fun and perfect for Miller! And true to form, the next day he started planning his party for the next year. All year long, Miller has been planning for his birthday party to be at Chuck-E-Cheese. I had even somehow convinced Miller and Sara Wells that they wanted to have their birthday party together. But then, about a month before his birthday day, Miller changed his mind. I think it was just too much change. He told me he wanted his birthday party to be EXACTLY the same as last year. Climbing, peppermint popcorn, chocolate cupcakes with black and red swirled icing and transformers for his friends. Last year was the easiest birthday party ever and so much fun! Since we were actually climbing boulders, the rule was only 3 friends. Lots of little boys running around climbing boulders is more than I can handle. Yes, that is right, McDonalds! For the longest time I had convinced the kids that McDonald's was "disgusting." Every time we passed a McDonld's they would all say, "Yuck! McDonald's is disgusting." But somehow Miller realized that he really does love "Old McDonald's." It is his very favorite place. It is the one place that he thought was even cooler than the Climbing Place to have his birthday party. His friends' moms may not have been too pleased with me, but Miller thought I was the coolest mom ever and that he had the best birthday party ever!!! !